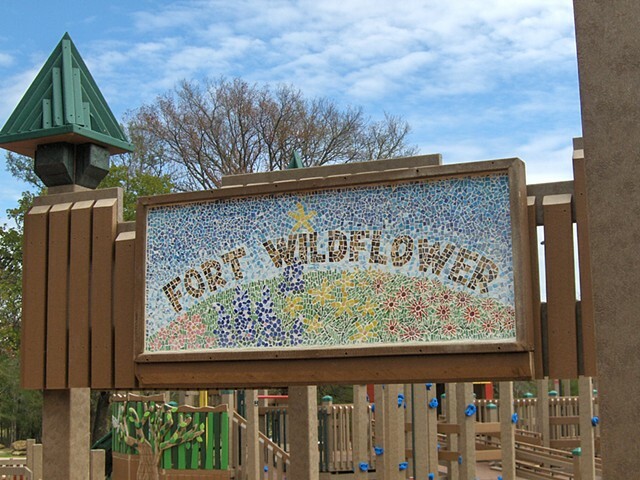 Mosaic Entry Signage, one of two entrysign tesserae murals made with volunteers for the FORT WILD FLOWER Playground, Heritage Park, Flower Mound,Texas. Murals are by commission only and can be glass tiles or original ceramic tiles, designed and glazed for a site specific project. The Mound / wild flowers relates to the town's namesake; The Mound of Flower Mound. There was never an actual building for the site. It was a meeting place for settlers on the westward expansion of settlements because it was a high place on the way through the CrossTimbers geographical region. The new signature park for the town, Heritage Park, in Flower Mound, is still under development, but the FORT WILDFLOWER PLAYGROUND is finished. Decorative items, flowers and animals were also designed for activity areas.